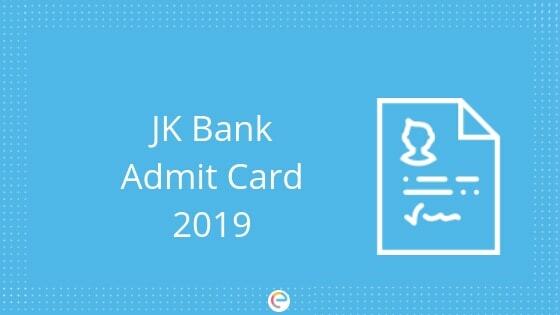 JK Bank Admit Card 2019: JK Bank has released the admit cards for JK Bank PO and JK Bank Associates on its official website. Candidates can log in with their Registration Number/ Roll Number, Password or Date of Birth to log in into the portal. The JK Bank Admit Card for PO was released on April 12, 2019. The last date of downloading JK Bank PO Admit Card 2019 is today, April 22, 2019. Moreover, JK Bank Admit Cards 2019 for Bank Associates are available to download from April 14, 2019, to April 26, 2019. It is mandatory for the aspirants to carry the JK Bank Hall ticket to the exam center. Otherwise, authorities won’t allow the candidates to sit for the exam. – 5th Step: Download and take a print out of the JK Bank Call letter for future reference. Card, Aadhar Card, Passport or Bank Passbook. Driving License, Aadhar Card, PAN Card or any valid ID proof issued by Gazetted Officer. Q: Will candidates be allowed to take the exam without their JK Bank Admit Card? A: It is mandatory for the candidates to carry their JK Bank Hall Ticket in order to sit for the exam. Without the admit card, they will not be allowed to take their exam. Q: Until when should applicants possess their JK Bank Admit Card? A: Applicants are required to secure their JK Bank Hall Ticket until the end of the selection process. Q: What should candidates do if they face issues generating their JK Bank Admit Card? A: Candidates can contact the official authorities and get issues regarding JK Bank Hall ticket resolved. Q: Is it mandatory to carry documents in the exam center along with JK Bank Admit Card? A: It is mandatory for the candidates to carry their Photo ID proof and Address proof along with JK Bank Hall Ticket. Q: What are the regions for which JK Bank Admit Card is released? For JK State: Awantipora, Baramulla, Srinagar, Jammu, Samba, Pulwama and Leh. For Outside JK State: Delhi NCR, Amritsar, Jalandhar, Patiala, Pathankot,Ludhiana and Chandigarh-Mohali. We hope that this detailed article on JK Bank Admit Card answers your queries. It is necessary to take JK Bank mock tests during your JK Bank Preparation. You can take IBPS PO Mock Test in order to understand the JK Bank Exam Pattern and JK Bank Syllabus as these exams are almost the same in terms of pattern and syllabus. Taking regular mock tests will not only help you have an efficient preparation for the exam but will also aid in improving your time management. If you face any issue regarding JK Bank Admit Card, do let us know about your queries in the comment section below and we will get back to you. Please contact the official authorities of JK Bank regarding the same. Hi Abid, Kindly contact the officials for this matter.